Located in Montmartre and a 6-minute walk from Sacré-Coeur Basilica, Appartement Amélie of Les Studios de Paris offers a bedroom, a bathroom with a shower and a kitchenette. Free Wi-Fi access is available in the whole apartment. Amélie Apartment includes a seating area with a sofa bed, a DVD player and satellite TV. An iron, bed linen and towels are also provided. Guests can prepare their own meals in a kitchenette equipped with a refrigerator, an oven and kitchenware. Amélie Apartment also has a dining area. 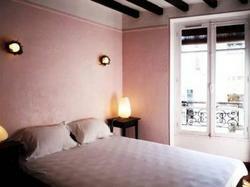 The property is a 4-minute walk from Abbesses Metro Station, which leads directly to Place de la Concorde. Private parking is available nearby at an additional cost. Please note that a EUR 500 damages deposit will be requested upon arrival and charged to your credit card. This may be used to charge for any damages incurred to the apartment during your stay. With free Wi-Fi access in common areas, this apartment offers a bedroom, a bathroom with a shower and a kitchenette. This apartment cannot accommodate an extra bed. This apartment is not accessible by a lift.